Some marketers still rely heavily on Clicks, Likes, and Shares. They put so much energy into it that they forget there is a much deeper process needed for success. Which in a nutshell, is the actual effective social media marketing strategy, necessary to bring in some real money. If you focus only on counting vanity metrics here is what will happen to your business. Even if your numbers in Clicks, Likes, and Shares are ok, after some time the money flow will decrease. Your marketers will get disappointed but won’t know how to fix the problem, because the numbers look ok. Ultimately, this situation will negatively influence the social media marketing team. Not seeing the results of their work will be frustrating and demotivating. Their productivity will drop as well as their motivation. Did I mention how the clients won’t be happy either? To the point where they just decide to take their business elsewhere? So to help you this not to happen to your business, here is an article on how to improve your marketing strategy and in the process build yourself an effective social media marketing team. What Holds Back Your Employees From Becoming An Effective Social Media Marketing Team? Have you ever thought what can a lack of good social media tools do to a team? One thing is that the entire workflow will run slowly. Managing social media work is not an easy task. Your team may have difficulties implementing proper social media marketing practices since all the social work is done manually. All kinds of mistakes can come up because of this, like forgetting to post on time, or to manage a certain account, etc. This will cause even more problems and frustrations. Your employees will over time feel overwhelmed and may become less productive. All of this may increase the resentment towards social media. Your employees might start to think in these lines – “I’m giving my best to rise above the entire social media noise and engage with my user, but somewhere along the way I’m making a mistake.” And they are not wrong. These micro problems may result in one big one – not having a pleasurable working atmosphere needed to develop an effective social media marketing team. Another thing that might happen is that the clients won’t be happy and they will complain. A lot. Especially if you mess up their social media strategy. If your marketing agency is facing similar problems like these, then this article is just what you need. See the following 3 ways your team can use to become an effective social media marketing team. Counting numbers is irrelevant to your clients. Collecting Clicks, Likes and Shares doesn’t provide the paycheck for your employees and will not pay for your winter holiday in Vail, no. In fact, less than 1% of the people visit a Facebook page after they have liked it. To make this easier for you, let’s assume you are the owner of an offline retail store. How would you discover the buying rate? The number of people who have entered and actually bought something (10). Those aren’t the same numbers, right? Sure, it’s cool 100 people entered and browsed through your store, but wouldn’t it be even better if all, or at least most of them, bought something, and not only 10? It’s the same on social media. The value of Clicks, Likes, and Shares is overrated. In 2019, these vanity metrics are not bringing any value to the client. Considering how many people are actually going back to the page, these metrics can’t be put into money. Their value is gone just as fast as Nicolas Cage when stealing 50 cars within 72 hours in ‘Gone in 60 seconds’. If your goal is to stay in the user’s memory longer than 60 seconds, you need to go beyond the Click, Likes, and Shares. What your social media marketing team needs to focus on is how to drive social traffic. You might ask, and how to do that? Well, one way to gain traffic is to create effective social media marketing campaigns on different social media platforms. This way your content will be available to a broader audience. Once you start to manage these campaigns, your marketing team will be able to generate more traffic from different sources. However, communicating with potential users is different on Facebook than on LinkedIn. The audience’s demographics and personal characteristics on LinkedIn have different goals than those on Facebook. The language used for communication and posting is different on these two platforms. Bottom line – your social media marketing team needs different strategies for generating social traffic on different social platforms. And what is the most productive way to do this? Automate the posting process on social media. If you automate the posting process on social media, it will be much easier for your marketing team to increase social traffic. With only a few clicks, your team will have a social media strategy planned even weeks beforehand. Automating this process will help your brand to be constantly present on social media. And at the same time, your team will be able to reach more users. Those users may, later on, transform into leads, leads into customers, but the starting point for any company is to be regularly active on social media. When we say active, it doesn’t mean being present on social media is enough. Because, if you don’t offer value, no amount of social will be of much help. And that leads to our second point. Having a quality content marketing strategy is important if you want to succeed in today’s digital world. Interestingly enough not a lot of businesses feel the same. 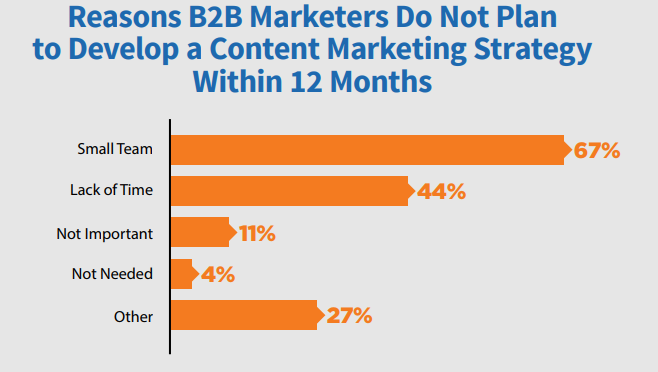 As you can see, companies have different reasons for not implementing a content marketing strategy. But that won’t make it less important. On top of that, there’s no time like the present to make sure you establish an effective content marketing strategy for your business. Let’s see why. Creating quality content is without a doubt, the cornerstone of an effective content marketing strategy. Any type of content – blog posts, case studies, video content etc. – should be written/made with the tone adapted to your specific audience. Your content should provide unique material, with relevant resources, as well as valuable up-to-date statistics. Sharing the content on social media regularly is one truly effective and proven way to become closer to your audience. The right type of content will make them connect and engage, they will get to know you, and vice versa. Once you create that trust bond, you will build yourself a respectful audience and over time, loyal customer base. You might think: “Ok, that makes sense, but how to achieve this daily interaction with users on social when there is just not enough working hours to do that”? The answer is in creating social media marketing campaigns. With advance planning of social media campaigns, your team will plan and schedule campaigns for several days, weeks or months in advance. That’s all in line with the content strategy they’ve created in the first place. This advance planning will help your team to stay present on social media at all times, and also give them extra time to do more than just social. Once everything is planned to the last detail, it will work wonders for the effectiveness of your team. The third and the last reason for content marketing strategy is the reusing of most successful social media campaigns. If your social media team has more responsibilities or deadlines than usual but doesn’t want to neglect the social media users, reusing or repurposing a successful marketing campaign may come as an ace up the sleeve. The team can’t go wrong with it since it has already proven its success. Also, this will give you an opportunity to reach a new audience. All you need to do is tweak it a bit depending on what info you want to focus on and that’s it, your campaign is ready. Even though all these three reasons seem quite straightforward, it is obvious that they still require considerable time and effort to pull off. There’s a silver lining though: all of them can be accomplished faster with the right social media marketing automation tool. But more on that later on. For now, let’s consider the third and the last way on our list of becoming an effective social media marketing team, sentiment and emotions analysis. Your team might focus on getting traffic instead of counting vanity metrics. They might also focus their energy toward creating quality content and sharing it on social media regularly. But, if the material you are sharing is not evoking emotions that would make the users take out their wallets and give you their money, it’s not working. All marketers know that the customers base their buying decisions on emotions. That’s because every customer goes through specific emotions in different stages of the buying process. Some of them may be at the top of the sales funnel, while others could be at the beginning of the funnel. Let’s say, you enter an accessories store. You want to buy a specific gift for your daughter. But, the seller immediately starts to ramble on about these new hats they’ve just received. He is clearly not paying any attention to you – what would you want or need as a customer. Clearly, he didn’t adapt his approach according to the customer’s needs. Same happens with businesses on social media. Why it’s important for the marketing team to adapt the social media strategies according to users emotions? Just like in our story, not everyone on social media is ready to listen to the hat offers when their interest is clearly something else. Or they might not be interested in anything specific, just want to browse. An effective social media marketing team will understand what goes in the user’s mind the first time they see the brand on social media. Some of them might be in denial and don’t want to hear about your products or services, while others can be completely receptive to your offers. Your social media marketing team should be familiar with the different emotional stages users are going through. So, if you use the same words and the same tone with all users, it would be like you are talking to no one at all. Adapting the social media marketing strategy according to the emotional stage of the user may give better results much faster than any other strategy. The user will feel much more understood and will press that call to action button. Whatever your team is trying to achieve on social will be hard to do without knowing and corresponding to the user’s emotional stage. You might wonder how to implement that? There’s a way to do that with a social media automation tool. But not just any tool. The only tool currently on the market that is offering such analysis is Populizr. 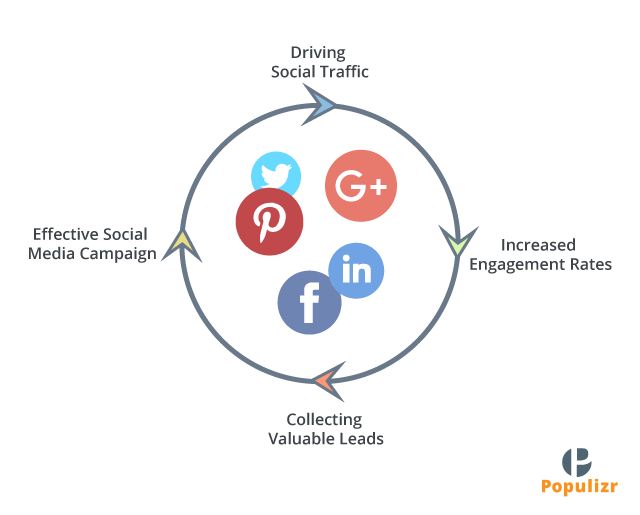 How Populizr For Agency Helps Creating An Effective Social Media Marketing Team? So, now you have the recipe to build an effective social media marketing team. All you need next is a powerful tool. And Populizr for Agency is exactly that. 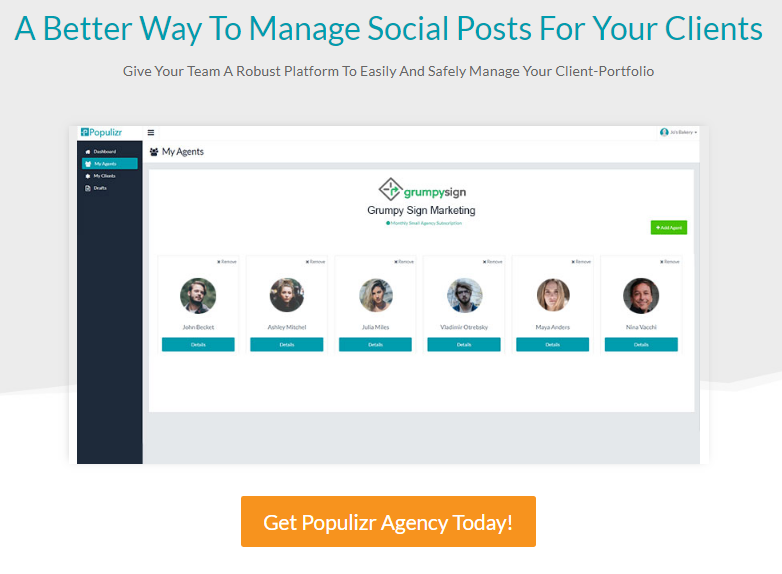 Populizr is an application that can transform the way your team uses social media. It easily connects multiple social accounts through one dashboard for easier management. 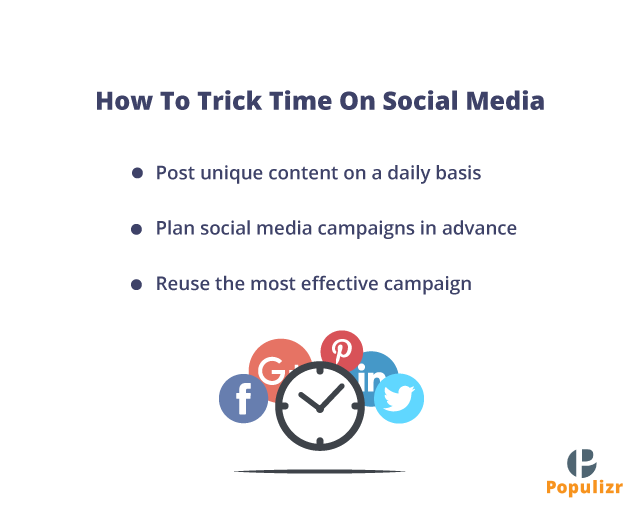 With Populizr you can Create, Schedule, Target and Track your social media marketing campaigns. With over 2 billion searches per day on social media, it comes as no surprise that businesses should focus their attention on getting social traffic. And Populizr for Agency offers for each account to create from 5 to 25 client profiles depending on whether it is Small Agency, Medium Agency, or Large Agency plan. You do the math there and see how much social traffic that is. Populizr has this amazing feature that creates up to 25 variations from a single blog post! Those variations can help your social media team reach more audience and consequently increase social traffic. Your team will be able to engage in all of these different platforms with unique content. Other automation tools just schedule your posts, so you end up creating duplicate content. And if you want to create variations of the text you have to do them manually. This is where Populizr shines, it creates the variations itself. All you have to do is give them few tweaks and they are good to go! Another feature that makes Populizr stand out, even more, is its Emotions and Sentiment Analyzer. It measures the emotions distributed throughout the text and gives you the overall sentiment. All this before the text is published so you’ll have an accurate idea of how your audience will react to it. Your team will no longer have to wonder what words do what, this feature will help them understand user’s emotions better as well as where and how to use them for the desired effect. This knowledge will greatly improve the quality of your content too. All these features combined with other options Populizr offers will help your team drive more traffic, post unique content more frequently, and with emotional analyze meet user’s emotional stage. Which equals effective social media marketing strategy. And, in the meantime, Populizr will also help your employees become an effective social media marketing team. If your social media team is constantly focused on vanity metrics, they are going to wait for that lead forever. Clicks, Likes, and Shares don’t do them justice anymore. They are no longer the criteria for creating an effective social media marketing strategy and they will not help your marketing team to grow either. These three ways combined and implemented into your social media marketing strategy will bring you more social traffic, more leads, and eventually more customers. And in that process, you will build yourself an effective social media marketing team. Win-win for all. But implementing these solutions is easier said than done. That’s why every effective social media marketing team needs an automation tool to do the grueling work of social marketing. This is where Populizer comes in with its unique features developed specifically to help you achieve an effective, long-lasting social media marketing strategy. You too can create an effective social media marketing team in the blink of an eye. If you have the right tool by your side. Get Populizr for Agency today and reap the benefits.